Hello Mimo, this searing portrait of love and loss is reminiscent of the Steven McCurry photograph of the Afghan Girl also taken at a refugee camp nearly 30 years ago. As a young man, I was mesmerized by that photo. Today, as a father of a daughter slightly older than Reem, I find your photo both mesmerizing as well as haunting. Thank you for taking the time to reach across the globe and seek out images that connect us. I pray that Reem continues to draw strength from within. This is very, very, very, sad. I wish for the world not to be able to stand on the outside of these conflicts comfortably looking on as children lose their lives and families. Her eyes are telling, more death and cruelty before them than one can absorb. May God keep her. No wonder she is not smiling.. Life has dealt her a cruel hand indeed. I agree with themofman we adults should be ashamed at how we let our children suffer so. You capture their soul Mimo! My heart goes out to her. I love eyes, and in people photography capturing the eyes can really add another level of depth to the image. This image is great the way the childlike artwork on her hand really draws you in to her face and eyes. You are left to wonder what significance the doodles on her hand have and what her expression means. Her eyes must have seen so many horrible things and yet in this moment there seems to be a peace around her. What do you think? What do you like about this image? Very touching, Mimo. You are doing a wonderful job here…keep it up and God Bless! What a story. Her portrait is amazing, Mimo. Raw and beautiful. Did you take that picture? of the green-eyed child? Are u back in Lebanon? How do u write “i love you” in Arabic, in latin characters. Vos photos sont très émouvantes. A very strong and intimate portrait. 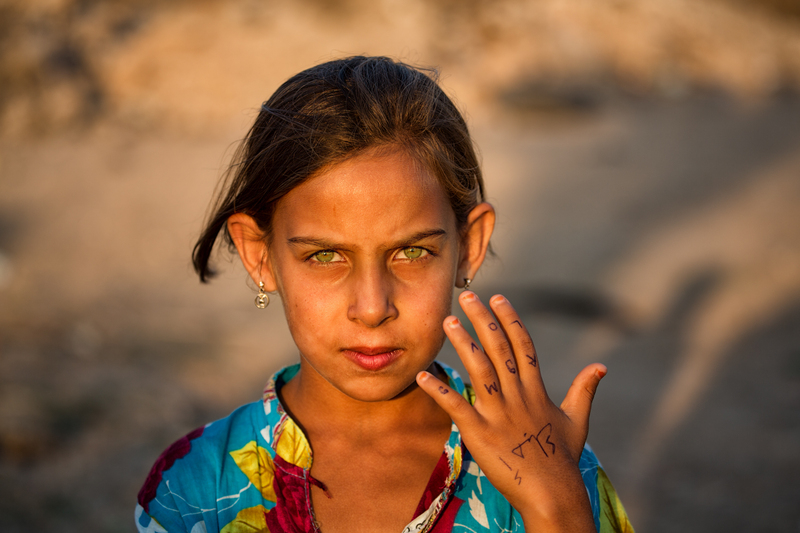 My thoughts went to the “Afghan Girl” by Steve McCurry. Very nice shot of you. Reblogged this on J.M. Photography. Your capturing of children and what is in their eyes are absolutely mesmerizing. To me, that is your calling. Beautiful picture with a sad story behind it. those eyes!!! are digging in my heart!! great shoot but a very sad story…. Such a beautiful child (those green eyes!) and such a sad story. Thanks for sharing the photo and story. Very powerful image, very thought provoking, thanks for sharing. This breaks my heart. She is beautiful and she is strong. Those responsible for these atrocities will answer for their evil, if not in this life, then in the life to come. But they will be held accountable. Life is hell for many of the world’s children. It’s a damn shame. We adults should be ashamed of ourselves for putting them all through hell. There is no real estate, natural resources, political ideology, religious belief or ego that is worth abusing children in the umpteen ways that exist. She is strong, she will go forth and find her way. Some have a tougher journey than others – whether that is good or bad is not for me to judge. The situation on this planet is out of sychronisation, this I ´m sure of, far too much pain, and I want it healed and corrected. Than you for a beautiful reply . I also want for this girl to have kindness and peace. Comfort her soul with love.